Though not sponsored content, I was provided a copy of this by the awesome folks at ClassicFlix. All opinions strictly my own. In 1937 MGM released the film Topper starring Constance Bennett and Billie Burke. 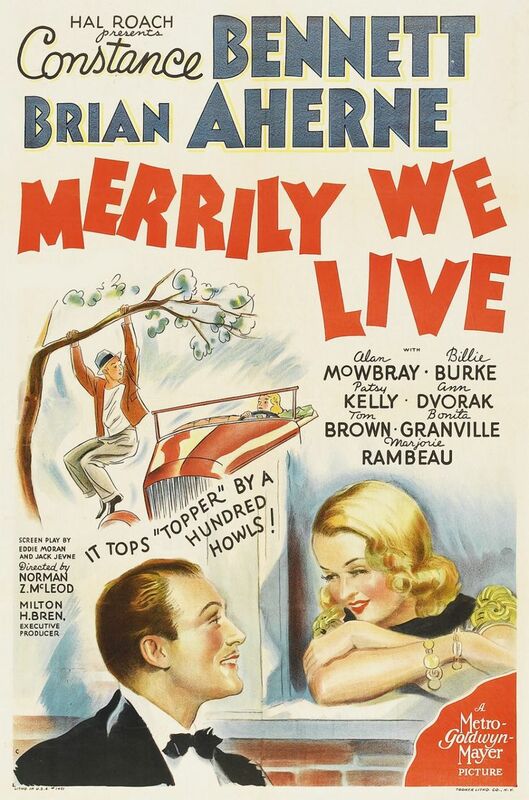 The success of that feature not only inspired two additional entries in the Topper series (1938’s Topper Takes a Trip, also starring Bennett, and 1941’s Topper Returns), but greenlit today’s film: Merrily We Live. The film is labeled an unofficial remake of the 1930 romantic comedy What a Man but it’s direct influence seems to be a film released two years prior. My Man Godfrey (1936) became a landmark in Depression-era cinema and Merrily We Live can’t help but look like MGM’s attempt to play catch-up with that Universal feature, right down to lifting direct sequences. Thankfully the film’s cast, particularly Burke (who secured her only Oscar for this role. Weird.) and Brian Aherne, keep this from feeling too derivative. Emily Kilbourne (Burke) is a society matron who can’t help bringing home forgotten men in the hopes of rehabilitating them. But after Emily’s latest discovery runs off with the family silver the boom is lowered: no more tramps. Conveniently, Wade Rawlins (Aherne) shows up around the same time, looking like a bum and catching Emily’s eye. She enlists Rawlins as the new Kilbourne chauffeur and soon Rawlins is catching everyone’s attention, including the Kilbourne’s eldest daughter, Geraldine (Bennett). The comparisons to My Man Godfrey aren’t detrimental to the movie but provide an inescapable sense of deja vu. Like that film, a tramp just happens to wander into the orbit of a family of daffy society peeps, though in this case Bennett’s “Geri” is the level-headed one in a sea of zany personalities. Wade Rawlins, like William Powell’s Godfrey, is cultured, educated, and causes all sorts of animosity within the family as he forces them to confront their own issues. This movie even has the gall to douse Bennett with water as she proclaims, “Rawlins! You do love me!” How did Universal not sue? On its own merits, though, Merrily We Live is just as fun as My Man Godfrey. Take that film, add a dose of the elegance of the Topper series, and you have Merrily We Live. The film’s opening breakfast scene may lack the ghosts of Topper, but there’s an unmistakable air you’ll feel with those features. Bennett’s Geri isn’t the good time girl of her previous feature. Instead she’s the only adult in her family yet still retains the required screwball flippancy most heiresses in these films possess. When the staff starts to go crazy over the lost silver Geri treats it with all the importance of putting her shoe on the wrong foot. She doesn’t want anyone to call the police yet still looks at her butler askance when he lays out a cadre of ladles and spatulas for everyone to eat with. Bennett isn’t manic enough to be a true screwball queen like Carole Lombard or Katharine Hepburn. I always find her to be too cold, untouchable, to be accessible. Here she’s certainly beautiful and a dependable leading lady, but she’s so overshadowed by the other performers. Bonita Granville plays Geri’s younger sister, Marion, and she hits every mark on the “annoying little sister” checklist. It’s hilarious how she delivers the line introducing Aherne’s Rawlins as “no Robert Taylor.” (If anything Aherne looks more like George Brent than Robert Taylor.) Aherne is the real find. He’s always “that guy” in movies for me and here he does a great job playing the mysterious stranger everyone seems to fall in love with it. It’s easy to see him as the man who got parts William Powell didn’t want, but he’s got excellent comedic timing. But the true star of the show is Billie Burke (when isn’t she, though?). Her Emily is a flower surrounded by a sea of moss in that she genuinely wants to help others. Her family sees her philanthropy as nothing but a nuisance. Emily, at times, is very child-like; she gets excited when her fish has babies. And yet she’s never afraid to make a joke at someone’s expense. Her attempt to mock a man’s laughter had me howling. It’s a role that, strangely enough, is different from most of the daffy matrons she played because she’s so central to the storyline. I could watch scenes from her in this movie on a loop. Because ClassicFlix is still a relatively new label – and with classic film access being what it is, everyone needs a boost – I should bring up the transfer here. Considering how hard it is to restore things on a budget, this looks utterly exquisite. The black and white sparkles and is on par with the work Criterion does despite the dearth of bonus features (if only they had a former employee providing audio commentary….just saying!). Considering that MGM doesn’t give any of their smaller classic films a cursory release, it’s great that ClassicFlix is doing the work to bring studio era gems like this out with a proper presentation. Merrily We Live is a fun little rom-com despite how derivative it can feel. The cast, particularly Brian Aherne and Billie Burke, will leave you laughing and Constance Bennett always looks lovely. I love this movie, but then I have a soft spot for Constance Bennett. I actually prefer this one over My Man Godfrey. I saw both My Man Godfrey and Merrily We Live for the first time last fall when they were released on Blu-ray. Merrily We Live was the first one I saw, and I enjoyed that one more, if only for the fact that it provided me with nonstop laughter (although I enjoyed My Man Godfrey a lot, too). I do think that the joke with Rawlins throwing the water on Jerry lacked the setup that it had in My Man Godfrey. Instead, it feels more like a pop culture reference that MIGHT be funny on its own, but is funnier when you know what it is referencing. Other than that, I really like Merrily We Live.